It’s going to be a blue Christmas. But despite what Elvis sings, it’s not because I’m going to be without you. 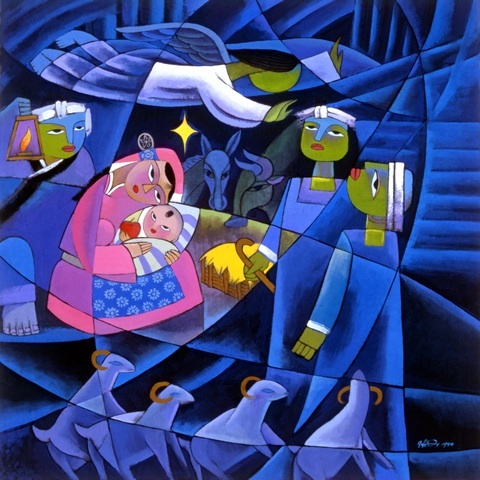 It’s because of the joyfully blue Christmas one of my favorite artists, He Qi, portrays in his Nativity. He Qi uses blue Christmas tones to portray the deep of the night on that Night of all nights. Everyone is “blue” that Christmas night except the virgin Mary, meek and mild, and her tender child who’s holding (of all things) a red apple in His hand. The red apple symbolizes the reason why your Christmas and mine should be truly blue: like Adam and Eve we have sinned and fallen short of the glory of God. But because Jesus came into our flesh to bear our sin and be our Savior, our spiritual night has been turned into day, and we have been saved. The angel tells it. the shepherds stand in awe. And Joseph stands watch. The Light of the world has come. Nativity, by He Qi. Used by permission. Go to www.heqigallery.com to view and purchase prints and posters. The hue is blue, but the mood is not. Into the pale, dark depths of a broken and fragmented world, a Star falls and lands into the waiting arms of a young lady, pink and pure. Faceless angels spread their arms in blessing, while sheep and goats bow their heads in praise. A father’s lantern wants to lend some light, but the Star provides a beam that will not be overcome. Lost in wonder, rag-topped men can do nothing else but crane their necks and gaze into the sky. From whence this light? From whence this love? From whence this Beaming Babe? A Star has fallen into the waiting arms of a young lady, pink and pure. And in His tiny hands, Eden’s fruit that, this time, will not be consumed. Spread your arms in blessing. Bow your head in praise. 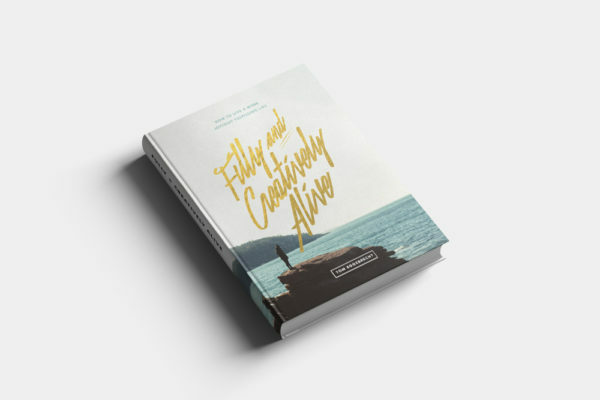 Bask in the light that will not be overcome. Lose yourself in wonder and crane your neck in eager expectation. The hue is blue, but the mood is not! The Morning Star has come to bring His beaming brightness into the pale, dark depths of a broken and fragmented world. The hue is blue, but the mood is not. What’s the reason you celebrate the joy of a “blue” Christmas this year?